NMR spectroscopy has become a major research tool used to characterize the structure of various compounds. 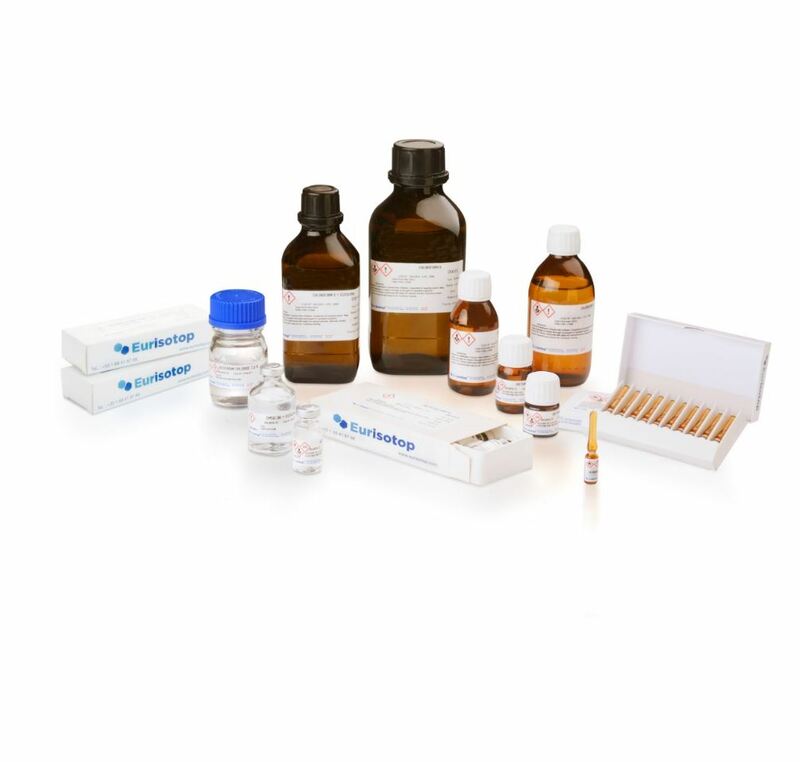 In order to assist the lab teams to carry out those analyses, Euriso-top has developed a broad range of consumables, and more specifically deuterated solvents with high isotopic enrichment and high chemical purity. Each batch of production is routinely tested for chemical and isotopic purity after initial purification, before packaging, and after packaging. In order to avoid isotopic contamination, all our deuterated solvents are handled under an inert atmosphere, such as dry nitrogen or argon. Some of our solvents are packaged in septum vials to avoid moisture contamination. For more information about your usual solvent, please refer to the data chart. The quality-control lab is equipped with a wide array of instrumentation, including gas chromatograph / mass spectrometers (GC/MS) and a high-field NMRs. Chemistry laboratories are equipped with apparatus for both large-scale (50+ liters) and microscale chemistry, which includes equipment for high-pressure gas reactions, pH and temperature-controlled enzyme chemistry, high-resolution distillation processes, and catalytic reduction with both hydrogen and deuterium . The production laboratories are also equipped with analytical equipment for in-process testing. All of these resources allow us to consistently produce products with high chemical and isotopic purity. All our production is evaluated before and after packaging. Water contamination is a common problem for deuterated NMR solvents. The water content of our solvents is tested via the KF titration method by our Quality Control Department. Consider using single-use ampoules. Many of our solvents are available in single-use break seal ampoules ranging in size from 0,5 mL to 1 mL. Handle solvents in a dry atmosphere. Dry NMR tubes and pipettes used for sample preparation overnight in an oven and cool them in a dessicator prior to use. Remove residual D2O by rinsing with methanol-d4 or acetone-d6 and then with the solvent of choice. This process will not remove water, but it will exchange the protons for deuterium and minimize the water peak. Chloroform D, Methylene Chloride D2, Tetramethylsilane (TMS), Tetrahydrofuran D8 and Tetrachloroethane D2 are not stabilized and are thus very sensitive to ultra-violet light and oxidation. Their storage under refrigeration at less than +4°C guarantees a longer shelf life. Before use, the vial should be left at room temperature to warm up before opening under an anhydrous, inert atmosphere. Tetramethylsilane (TMS) is a very volatile compound (bp = 26°C). To minimize its loss, it is packaged in a “penicillin” type vial sealed with a TeflonTM faced septum. It is necessary to keep it in a refrigerator. Dimethyl sulfoxide (DMSO) has a melting point of 18°C, freezing close to room temperature. It may be at a solid state when delivered, but to turn it to a liquid state just thaw it in a warm water bath. Care must be taken to prevent water contamination. All deuterated solvents must be handled in a strict anhydrous and inert atmosphere (dry nitrogen or argon) in order to minimise the absorption of moisture. This absorption leads not only to an increase in the HDO concentration and the resultant signal in 1H NMR spectrum, but also to an exchange of the easily labile protons (especially heteroatom-linked protons). Solvent vials must be immediately re-closed after use and the solvent removed from an ampoule transferred into a dry vial. Very hygroscopic solvents packed in “penicillin” type vials are withdrawn with a syringe. It is recommended to flush into the vial an amount of dry nitrogen equivalent to the amount of solvent to be collected. The signal of the protons of the dissolved substance should be greater than the signal of the residual proton of the solvent used. So the quantity of the product depends on the isotopic enrichment of the solvent and on the field applied in the NMR spectrometer. The products are packaged according to their physical and chemical properties. We use the best available packaging materials to enable a simple and safe utilisation while preserving the quality of the products. Quality is carefully monitored during production and packaging, using instrumental analysis. 1. Flame-sealed glass ampoules under inert atmosphere. 3. Vials “penicillin” type with Teflon sealed under inert atmosphere, for acetone, acetonitrile, benzene, DMSO, Methanol and also for deuterium oxide. For any special packaging, please request a quotation.